Three Minute Thesis (3MT®) is a research communication competition developed by The University of Queensland (UQ). Research higher degree (PhD and MPhil) students have three minutes to present a compelling oration on their thesis and its significance. 3MT is not an exercise in trivialising or ‘dumbing-down’ research but challenges students to consolidate their ideas and research discoveries so they can be presented concisely to a non-specialist audience. CDU will be competing in the 3MT in 2019. Tentative dates are set out below. The winner of the CDU Final will be sent to the Asia Pacific Final to compete. The Asia Pacific Final will be held on 4th October in Brisbane. Rebecca Amery, CDU’s Three Minute Thesis (3MT) 2018 Winner, represented CDU in the Asia-Pacific Semi-Finals of the 3MT in Brisbane on Thursday, 27th September. To find out more about the competition, go to the 3MT website. We had a great crowd and the presentations were outstanding. At every level of the competition, each competitor will be assessed on the three judging criteria listed below. Please note that each criterion is equally weighted and has an emphasis on audience. The 2017 CDU Final Winners! The CDU 2017 3MT final was held on Friday 8 September. We had ten competitors this year, and the standard was excellent. Leena used her 3MT prize money to travel to the Asia-Pacific FInal in Brisbane on 29 September. Ms Rhiannon Moore – current CDU School of Psychological and Clinical Sciences PhD candidate and 2016 Winner of the CDU 3MT Final. Thanks also to Sharon McGregor for taking photos for the event. The Asia Pacific final was held at The University of Queensland on Friday 30 September 2016. Rhiannon represented CDU at that final. 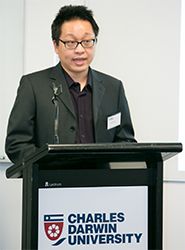 The winning presentation, by Joshua Chu-Tan from Australian National University, can be seen on Vimeo. To find out more about the 2016 finalists and to view their presentations, go to the 3MT website.